Raising a child with special needs is no easy task. I found myself alone with Courtney most of the time. It was isolating to say the least. Jonathan continued on his own path and before we knew it he left to go to college and Courtney and I tried to find a new way of doing things without big brother around. I had learned to listen to Jonathan over the years. He had been through much in his life, not only in regards to his sister but also struggling to find a place to fit in to. He wanted friends and found it difficult to make them. His life was so different than most of his contemporaries. We had tried different things over the years, one on one counseling, support groups and spiritual direction. He never found one that he felt one hundred percent comfortable with. He spent three semesters away and then hit rock bottom. Jerry and I could see it happening. I had been praying for years for him to know how much he was loved, for him to know how special he was to us, for him to know how proud we were of him and how we wouldn’t be the family we were without him in it. He had wanted to go away to school. But sometimes, even though you pray with all your heart and soul, God allows things to happen that break your mother’s heart. I knew in my heart he wanted to run away from all the hard. As much as I encouraged and told him how important and awesome he was to me and to God, somewhere in his heart he could not accept it. He came home from college wounded, deeply sad and very tired. He was also very, very angry. At us, at God and the whole world. He was angry at everyone but Courtney. After all it wasn’t her fault she was the way she was. Jerry and I tried to handle things on our own but then on the advice of dear friends, we sought professional help. I praise God to this day for the wonderful Catholic psychiatrists and psychologists who do there best to help those who struggle with depression, PTSD and anxiety. They saved my son and they saved my family. My heart broke all over again as I had to sit on the sidelines while Jonathan confronted his anger and anxiety. I would pray rosary after rosary in the waiting room during his counseling sessions begging Our Lady, one more time, to cover my baby boy with her mantle of protection. I would whisper into Courtney’s ear every night asking her to pray for Jonathan. She would just smile and giggle as if to tell me “Oh Mama. Don’t worry. God’s got this.” It was a very long road to recovery for Jonathan. The PTSD from watching his sister almost die time and time again still rears it’s ugly head from time to time when someone he cares for is ill or struggling physically. But we stayed the course as a family and fours years after all of this was discovered he became my smiling, joking, intensely private but very tender and caring son again. He walked through hell when his sister died and once again, Jerry and I had to hand him over to God trusting that all would be well with the right help. He didn’t know who he was without her. Hell I didn’t know who I was without her. However God knew who he was and so did our Mother Mary. Each of them showed up in their own special ways to show my son how awesome he really is and that God has a job for him to do, just like he did his little sister. I celebrate God’s faithfulness and praise His name every single time my son hugs me or we share a wonderful laugh together. 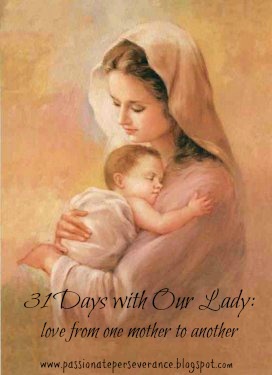 I thank the Blessed Mother for showing me how to love through prayer and fortitude of spirit. This vocation of motherhood is know joke. It is intense and filled with so many ups and downs. I am constantly amazed that we have made it this far without giving up. God is good ALL the time. No matter what storms whip up the oceans in your life, God is there, holding the boat steady. Our Lady is there ready to hold and protect. Jesus is there holding out His hand encouraging us to stretch out and walk on that water, to come to Him and live. So many times I want to give up and just walk away from all the hurt and sadness life can sometimes bring. How much am I supposed to endure as a wife and mother? How much hurt can my heart take before it explodes in hate and despair? You remained by Jesus’s side his whole life. They spat on him and whipped him and you remained steady and true, always loving and always praying. How did you remain standing through it all? So much pain Mama. Help me to persevere as you did. Help me to see the truth of the situation like you did. Help me to not walk away from the pain. Help me to stay strong knowing that it is only for a short while as my heart stretches to hold it all. Help me to keep my eyes fixed on heaven and allow me to suffer for a purpose. So that God may be glorified now and always.